The Chili Pad™ is a revolutionary Cooling and heating system designed to regulate the surface temperature of your bed so that you can achieve a great night's sleep. The ChiliPad™ allows you to control the temperature of your sleeping surface at the touch of a button. Designed to fit all standard and extra thick mattresses. 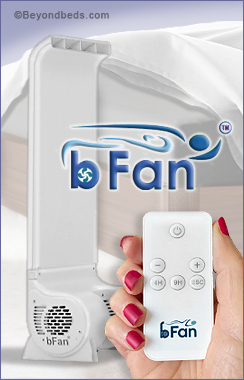 The bFan® helps to remove body heat that gets trapped under your sheets. A gentle, cool breeze, starts at your feet and flows over your body and up along your head and neck area to lower your body temperature. The bFan® is low voltage and uses less than one amp of power, making its use cost effective.Dual fans are capable of producing over 100 CFM (cubic feet per minute) of air flow. With the Speed controller, which can be placed under your pillow, you can adjust the air flow from 0 to 100 CFM, or turn the bFan® on or off, without having to get up out of bed. Create your own cool zone with the bFan®. Our ChiliGel™ cooling body pad is specially formulated to absorb and dissipate body heat throughout the night, providing hours of cool comfort. ChiliGel pads are comprised of a proprietary, 100% water based compound polymer gel, and are completely maintenance free.